Gustavo Dudamel returned to the Los Angeles Philharmonic podium for the first time since October 14, 2012. Most of the next few weeks will be devoted to preparing programs for the orchestra’s upcoming tour to Europe and New York, but this past weekend’s concerts were not going to be played out of town. On paper, it seemed like an unexciting tune-up — Music Director and orchestra getting a little re-acquainted after a few months apart by playing some Romantic oldies by Wagner and Schumann, and joined by star violinist Gil Shaham for another run through the ubiquitous Brahms violin concerto. Fortunately, what could have been a hum-drum concert turned out to be a lovely Sunday afternoon of music, with Messers. Dudamel and Shaham helping to bring these works to life. Pieces that can easily feel like drab museum pieces instead were made to sound vigorous and contemporary. The collaboration between conductor and soloist in the Brahms was particularly rewarding to experience. These are two extremely committed musicians who are always having fun while they are on stage, and they aren’t afraid that anyone else knows it. As Mr. Dudamel conducted the introduction to the concerto, Mr. Shaham looked around Walt Disney Concert Hall with a broad, open-mouthed smile and a wide-eyed look of wonderment, like a school boy thinking, “Wow, this is soooo rad that I’m standing here.” As he started playing, the smile rarely left, but the intensity and pinpoint accuracy in his playing belied the easy-going look on his face. Throughout the concerto, he did his best to explore his solo space, walking right up to the conductor one moment, then over to Principal Concertmaster Martin Chalifour the next. Regardless of what he did on stage, he sounded great. This was a crisp, almost edgy performance, with soloist bringing out the rustic qualities of the score. At the same time, he knew when to just let Brahms be Brahms; he never shied away from making the prettier moments sound lush, but he never wallowed in them either. Mr. Dudamel and the LA Phil gave nuanced, well-balanced support, without ever letting the proceedings get emotionally out of hand or over the top. Principal Oboe Ariana Ghez provided a particularly tender solo in the second movement. When it was done, the audience erupted with cheers and an immediate standing ovation. During the curtain calls, conductor and soloist both wore massive grins while they bantered continuously. Eventually, Mr. Shaham bowed deeply to the conductor at center stage; the conductor responded by genuflecting in front of the violinist. Happiness abounded. The other two works on the program were equally impressive, but for very different reasons. The Wagner excerpt, “Siegfried’s Death and Funeral Music from Götterdämmerung,” shimmered and rumbled as a showcase for orchestral color. Wagner’s typically extravagant orchestration (which included four harps, four Wagner tubas, and a bass trumpet, among other, more typical instruments) provided Mr. Dudamel the perfect palette from which to create a vivid and surprisingly translucent soundscape. The brass shone triumphant without ever overpowering. The Schumann Third Symphony (aka, the “Rhenish”) will forever be linked in my mind to Carlo Maria Giulini’s transcendant recording of the work while he was Music Director of the LA Phil, unabashedly big-boned but surprisingly lucid throughout. Mr. Dudamel’s rendition on this day came as close to that as I’d ever heard. Under other conductors, the symphony has sounded thick and blocky, no matter what tempos were applied. In contrast, Mr. Dudamel allowed it to be grand without ever becoming grandiose, conducting with zeal while not micro-managing or over-seasoning the details. Tempos were kept away from the extremes, and textures were nicely layered. Combined, the two orchestral works gave the latest indication that the LA Phil’s current Music Director is becoming more adroit at creating transparency in the orchestra’s sound without sacrificing the warmth he has injected into it during his tenure. Moreover, he managed to revel in big moments without ever exaggerating them or turning them into bombast; sometimes, when you want things spicy, you don’t have to resort to a habanero when a jalapeño will do the job just fine, and increasingly, it seems that Mr. Dudamel is reaching for the jalapeños. Call it restraint, call it maturity, call it whatever you may — I’ll just welcome it and look forward to more. Julien Beaudiment played as guest principal flute for all four concerts in the program. 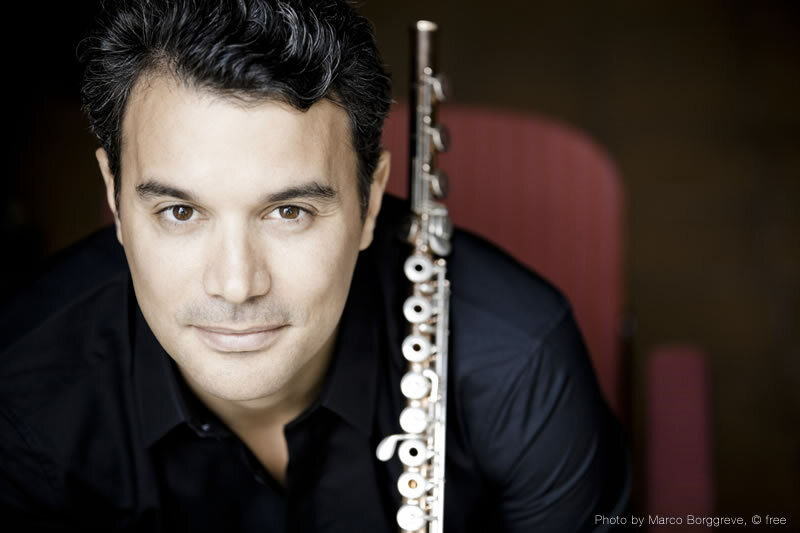 Though no official announcement was made, it is almost certain that the French musician was playing a trial week as a candidate for the full-time Principal Flute position with the orchestra. One major clue is that on his online schedule, Mr. Beaudiment lists a recital on Feb 21 at Walt Disney Concert Hall. There were no tickets being sold for such a recital on that day (or any day); private recitals are part of the evaluation process for candidates invited to audition for titled position such as this one. I have no idea how likely it is that he’d be awarded the position; however, I can say that after he played his last note on Sunday, the woodwind players around him (including Principal Clarinet Michele Zukovsky, Associate Principal Oboe Marion Kuszyk, and Associate Principal Bassoon Shawn Mouser, among others) offered smiles, enthusiastic handshakes, and two-cheeked kisses to him before they all left the stage. Among the music fans in attendance was Laura Danly, Curator of the Griffith Observatory and frequent contributor to popular TV astronomy programs such as The Universe. Tags: Brahms, Gil Shaham, Gustavo Dudamel, Julien Beaudiment, Schumann, Wagner. Bookmark the permalink.